Two SAI Florence alumni, Holly and Julia, recently reunited in Chicago. 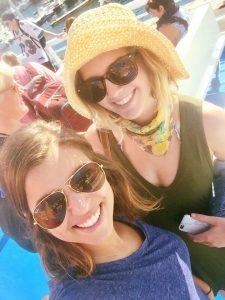 The two close friends submitted a blog post on how they met while studying abroad in Florence. Ciao! The first day we met each other was in our small apartment on Via San Gallo. Soon after that, we started planning trips together and getting to know the beautiful city of Firenze. One thing that we both had in common was our desire to take in everyday in Florence like it was our last. We loved randomly exploring the city, and going into all the non-touristy neighborhoods. In addition, the first weekend we were abroad we became best of friends with the trattoria (casual restaurant) below our quaint apartment and this became a frequent spot for us. Along with this trattoria we found some other spots located on San Gallo such as Kitsch where we went for aperitivo (drinks and light snacks before dinner). 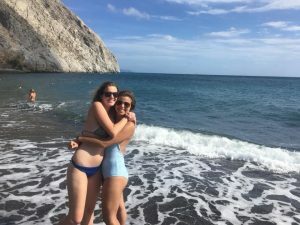 Throughout the semester we traveled throughout Italy as well as Europe together, and were able to plan trips to five countries (Switzerland, Greece, Czech Republic, Germany, England). We both got to experience the beauty of sunsets in Greece to the breathtaking views of the Swiss Alps. Every trip introduced us to new perspectives of different cultures and customs. For instance, eating beef goulash in Prague or singing and dancing with the locals at Oktoberfest. Although we traveled throughout Europe together we were able to experience multiple aspects of the beautiful country of Italy. For example, we decided to take advantage of the weekend long trip through SAI. During this weekend, we visited the tiny beach town of Castiglione Della Pescaia. Here, we were able to explore this beautiful destination that was placed right on the Mediterranean Sea. While we were here, we took the ferry to a small Tuscan Island called Giglio where we swam and ate a delicious meal of caprese and had some yummy gelato. We both enjoyed taking part of this memorable non-touristy weekend with SAI. Although our time in Florence together has come to an end, the friendship and memories that we have shared will never fade. 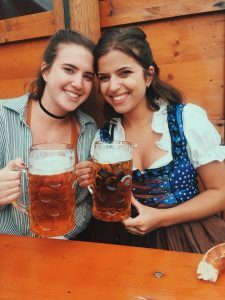 Recently, Holly visited Julia in Chicago for their spring breaks, and Julia is planning on visiting Holly in Boston sometime in the near future. We would love to travel together and visit new destinations with each other. We hope to be back in our “home” city of Florence one day! Grazie mille SAI for this unforgettable semester abroad. 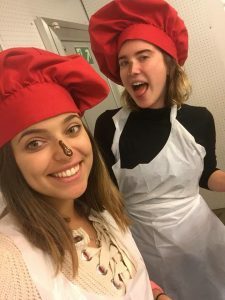 Holly and Julia were Fall 2017 SAI Florence students from Lasell College and Bradley University.